This reserve contains a pine grove, numerous interesting tree specimens as well as a marsh. Its location along the Shawsheen River and away from homes makes it an ideal natural habitat for birds and wildlife. The original 14.5 acres was a gift from George K. and Frances Sanborn in 1959. George was an AVIS trustee at the time and provided this gift as an incentive for others to donate land. An additional one-half acre on the east bank of the Shawsheen between the original parcel and Route 93 was purchased by AVIS in 1966. An additional AVIS purchase of 11 acres in 2015 provided road access to the property that formerly could only be reached by water. With this additional land the Meg Batcheller trail was created connecting through the Town Conservation Commission’s Lightning Tree reservation. An improved parking area was added in 2017. 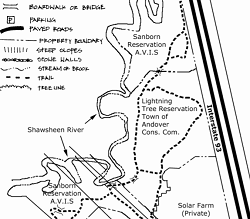 In April, 2016, as result of collaboration between AVIS and the Conservation Commission we celebrated the creation of the Meg Batcheller trail through the Sanborn and Lightning Tree Reservations. On the east bank of the Shawsheen River just upstream of Interstate Route 93 at end of South St.
Use access road at the very end of South Street through Tewksbury. (Use 1320 South Street, Tewksbury for GPS) or by canoe or kayak from the Shawsheen River.